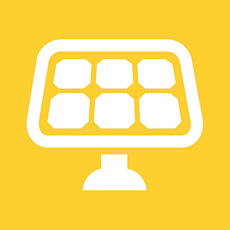 Solar Panel Calculator Plus calculate custom Off-Grid Solar Home Power Systems. Use these handy calculator to help decide which system size is right for you. You can calculate the Exact Number of Solar Panels You Need For Your Usage Plus the Space you need. Also include Battery Capacity for your Home Power Systems. Find the energy used in a day. Figure out how long each electronic device will be run in hours during a day. Multiply the wattage of each device by its run-time to get the energy in watt-hours per day. Add up all the watt-hour values to get a total for your home. Example: Light bulbs run for 5 hours a day. Computer runs for 2 hours a day. 100 x 5 + 300 x 2 = 1100 watt-hours. To determine the inverter size we must find the peak load or maximum wattage of your home. This is found by adding up the wattage of the appliances and devices that could be run at the same time. Include everything from microwaves and lights to computers and clocks. The sum will tell you which inverter size you need. Example: A room has two 60 watt light bulb and a 300 watt desktop computer. The inverter size is 60 x 2 + 300 = 420 watts. Multiply with 1.2 or 1.5 into a safe area. Now decide how many days worth of energy you want to store in your battery bank. Generally this is anywhere from two to five. Example: You want the battery bank to last three days without recharging and that you use 5.0 kwh per day. As 5.0 x 3 x 2 = 30.0kwh, this is the energy we need from the batteries. Converting this to AH we have to divide by the voltage of your system. This can be 12, 24 or 48 for commercial application. If we choose to use 48V, the minimum AH capacity is then 30 000/48 = 625 AH. Now if you divide by your battery's rating you find the number of batteries you must use. The larger the system you have, the higher the voltage you should have. It is normal to match a 12 V battery bank to a 400 W power system. A 5 kW system would work most appropriately with a 48 V wiring system, in order to decrease current flow in the wires. Note: Colder temperatures have a negative effect on the capacity of your battery bank. If your battery bank is always indoors in a heated area then you don't have a problem. But if they're stored in an unheated area during the winter then you'll need to account for this. The most typical solar panel size used for residential installations is 65 inches by 39 inches. And the wattage output range from 200 - 330 watts.